My first month I focused on getting settled and making new friends, finding my sense of belonging in a new city and school, which included searching for clubs or events I could be a part of. I saw the internships link, clicking on it, and went through the catalogue for something interesting or fun. Most of them didn’t fit what I was looking for, but then I came across an internship that sparked my interest. I am a business major with a concentration in digital media, I work as a freelance web designer, and my siblings and I started our own business in blogging, media, and fashion. The internship was highlighted as media management for a wedding planner in Rome who organizes destination weddings for couples in Italy. She also happens to be a fashion designer with her own clothing line and is an interior designer who has been featured in multiple well-known magazines. I couldn’t scroll past this opportunity, so I immediately submitted an application. This was an amazing decision. First, having an internship abroad looks beautiful on your resume. The things you learn and experience working in a foreign country are priceless. Internships allow you to figure out whether a job is a right fit for you or not. I was able to take my media classes in Rome and in my major, and implement them to a real life working environment with my internship. My internship was not a huge time commitment, so I didn’t feel overwhelmed by my work, school, and travel load. 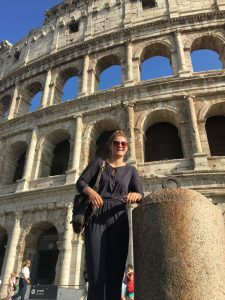 Learning a new language, meeting new people, networking, understanding how to work with a different culture, balancing this difference in your work and in your communication skills: these are all major learning curves I went through working abroad. With all of these new experiences there came funny moments as well. My boss, the wedding planner, is a single mom and very busy in her business so we had our weekly meetings at her house most often between kids pickups and drop offs, or before or after dinner during the kid’s playdates. When I was at her house I met her children and got an idea of how an Italian family functions. 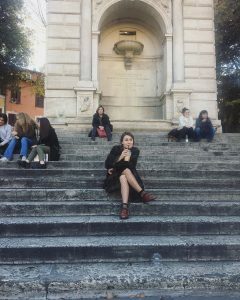 I learned about the Italian work environment, which is very relaxed without a strong sense of timing. Meeting dates and times were not strict and we met often within the hour before or after we were originally supposed to meet. My commute to our meetings was about an hour and a half, so I really got to understanding the transportation system in Rome. I built a lot of self-confidence in my survival skills and in being alone, trusting myself. You gain a strong sense of independence from these events. On one of my first commutes, I didn’t know you had to press the button on the bus for it to stop where you needed to get off. You can imagine my confusion when the bus drove 30 min past my stop, as I watched the circle pass my destination on Google maps, becoming more and more skeptical of my sense of direction. After passing my stop back and forth more than three times, I decide to just walk from another stop because I gave up on the bus driver being oblivious to my needs. Later of course I find this out and cannot stop saying “WOW” to myself for three days straight. It was definitely a funny memory, but at the time I was so uneasy about being late to my meeting, getting lost, and not knowing a LICK of Italian! These bus ride commutes forced me to get out and be around the city in places I probably wouldn’t have gone to otherwise. I saw so many beautiful sites sitting with my earphones in, enjoying the free tour of the Italian culture. So if you’re looking to get involved or experience your city in a new way, say yes and apply. I promise you won’t regret it. 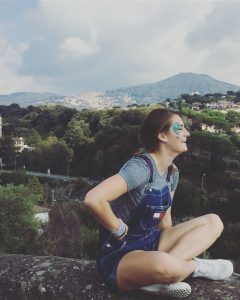 Lauren was a fall 2017 SAI Rome student from Saint Mary’s College of California.